Intranets may be owned by Communications, HR and/or IT but that doesn’t mean that they don’t have business value. Successful Intranets ensure that employees get the information and tools they need quickly to do their jobs effectively and be productive. Intranets can be a gateway for employees to access policies, procedures and forms as well as applications they need to complete tasks. Effectively designed intranets with intuitive and easy to use information architecture can greatly improve employee productivity. Additionally, adding intranet 2.0 collaboration tools can increase knowledge sharing and aid in developing solutions and growing the business. Prescient has a five-phased approach or methodology that our intranet consultants use to create highly effective intranets. 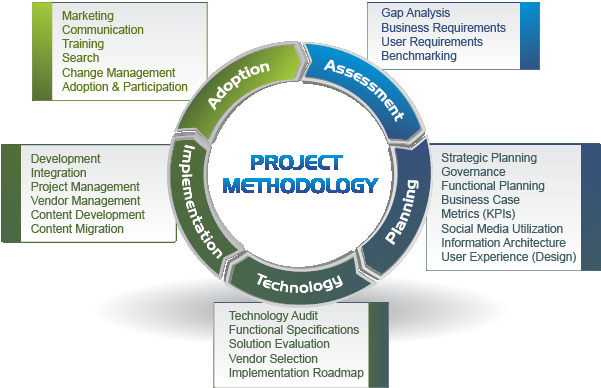 The first phase of this methodology is the Assessment phase, where the business and functional requirements of the intranet are determined and documented, followed by the all-important Planning phase. The two phases -- Assessment and Planning -- encompass the key elements of an intranet business strategy. Despite the traditional focus on technology and integration, it is these initial strategy phases that are the most important predictors of future intranet success. At the heart of an intranet’s success is the strength of the strategy that governs it, and a successful strategy requires a process that is exemplified by Prescient’s unique methodology that is focused on the initial intranet Assessment and Planning phases. Prescient’s Intranet Blueprint © 2013 service (and the accompanying Internet version) is the all encompassing website and intranet design and blueprint for building or redesigning an intranet or website. Using our unique intranet methodology, our consultants construct a complete website or intranet plan that encompasses all the details including information architecture, governance and design.